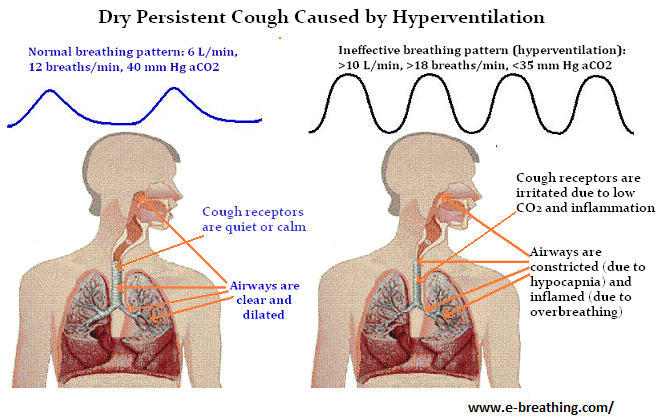 Chronic or persistent dry cough is a major respiratory symptom of chronic hyperventilation and low body O2. Some of the most common causes of dry cough are inclusive of health problems like bronchitis, asthma, cystic fibrosis, COPD, respiratory infections and a number of other lung related conditions. Dry cough also tends to get worst during sleep or at night, on exertion and particularly after meals. Air typically travels through the nasal cavities during normal breathing at a speed of about 8 km/h. However, when we start coughing via the mouth, the air tends to rush out via the airways at about 120-160 km/h. This triggers significant mechanical stress or irritation, and sudden CO2 losses with the following effects of alveolar hypocapnia or low CO2 levels in the airways: irritable state of the cough receptors, bronchospasm or constriction of airways, and substantial mechanical friction in the airways due to sudden strong air flow etc. 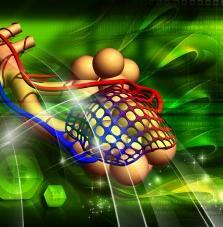 Moving on, because of a reset in the breathing center, irritation of airways and overbreathing become chronic. 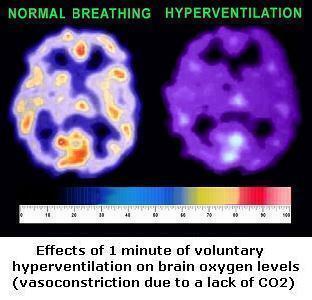 To begin with, there are countless scientific publications that have shown an apparent link between hyperventilation and reduced body-oxygen content because of alveolar hypocapnia (low CO2 levels in the lungs). Apart from that, there are extensive medical research based evidences that have shown that low CO2 has the potential to over-excite nerve cells and makes them more irritable. The over-excitement of the nerve cells additionally impacts nerve cells that control the urge-to-cough reflex that is typically triggered after increased irritation in the upper airways or chest. The problem get worse at nighttime when in bed, especially during supine sleep position. What this means is that the more you cough (particularly via the mouth), the more CO2 you will eradicate from the body, and the worse your symptoms are going to become. This is true at night when someone sleeps in a horizontal position. More than 180 Russian medical doctors who practiced the Buteyko breathing method developed a series of simple breathing techniques to help their patients reduce coughing. These techniques further allowed them to eventually eliminate and get rid of all sorts of coughing symptoms, including persistent dry cough. This simple home remedies work even at night during sleep.